Most of us know that Jesus should be a central part of our marriage. We talk to our students about Christ-centered relationships using the image to the right; explaining that as a couple maintains their focus on God and moves closer to Him, they will also move closer to one another. But what does that really mean? 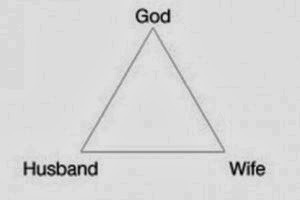 How does that look in the daily grind of a marriage with all its ups, downs, joys, struggles, and mediocre moments? Obviously, none of us will ever measure up to the ideal. God should be first in our hearts and our minds every moment. If this were happening, it would be easier to love our spouses. The love would flow from Christ, and we’d have a wellspring of compassion, forgiveness, patience, and forbearance. We don’t know for sure, but our guess is that you’re just like us—you try real hard, but sin and life just keep getting in the way! This is normal and okay. A true Jesus-centered marriage is one where both spouses strive to keep Christ as the focus—strive being the key word here. What does striving mean in a practical sense?